This course provides a general overview of maps as social, cultural, intellectual tools and their place in the library and the academy. It is intended for rare book curators, generalists, conservators, map librarians, antiquarian dealers and collectors who seek to focus on the particular nature of the cartographic materials that impact their work or interests. A mix of presentations, including slides, group exercises, hands on work with maps, atlases and globes, will familiarize students with the map as artifact. This course will be a prerequisite for future RBS map courses in the cataloging of rare maps, preservation of prints and maps, and courses devoted to Ptolemy / Sanson / Blaeu, &c.
Although this course is intended to introduce map history, participants will derive most from the course if they have already been exposed to the problems in understanding maps and who might eventually take advanced courses in this subject at Rare Book School. Such participants might include rare book librarians, conservators, map librarians, map collectors, and map dealers. In their personal statement, applicants should describe the nature of their developing interest in the history of the map, their expectations of the course, and the purposes to which they propose to put the knowledge gained from the course. Alice Hudson teaches this course, as "Introduction to Printed Maps." This course is not currently being offered. 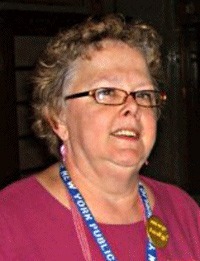 Alice C. Hudson is retired Chief of The Lionel Pincus & Princess Firyal Map Division in the Stephen A. Schwarzman Building [formerly The Humanities and Social Sciences Library] of The New York Public Library. She has taught map librarianship at the Pratt School of Information & Library Science, where she is an adjunct professor, since 2002. She has written and spoken widely on the history of cartography.